As I reflect on this year’s Kicking Bear events with my wife Karen, I realize what a gift God has given me in her as we work together to do God’s will. Throughout the nation this year, we have witnessed so many victories in Christ as kids were taken off the streets, attended our camps, had a bow put in their hands, and shown a better way of life. We let them know that no matter what their problems were, God has a plan and purpose for good in their lives. We were discussing new camps this year and how they mirrored camps from the past. One was in Rockwood, Tennessee at Camp Ozone, run by Brent Woodward and his team. We had an absolute blast with all the kids—this camp was much like Cambridge, Ohio’s first camp that started with only 60 kids in attendance, but over five years, has now grown to over 800 kids! Much like one of the kids in Tennessee, at the first Bridgewater, ME camp I met a young man named Austin (below) whose grandfather had driven over four hours to help him attend the camp. Austin was so distraught that he wouldn’t get out of the vehicle. His grandfather told me Austin’s parents had recently abandoned him. When I talked to Austin, I let him know that I had similar problems when I was a boy, and if he would trust me, we were going to have an awesome time together. He stepped out of the truck, joined in with all the other kids and participated in the activities. That night, in front of the bonfire when the Gospel was shared by an injured warrior, he was one of the many who gave his heart to the Lord. 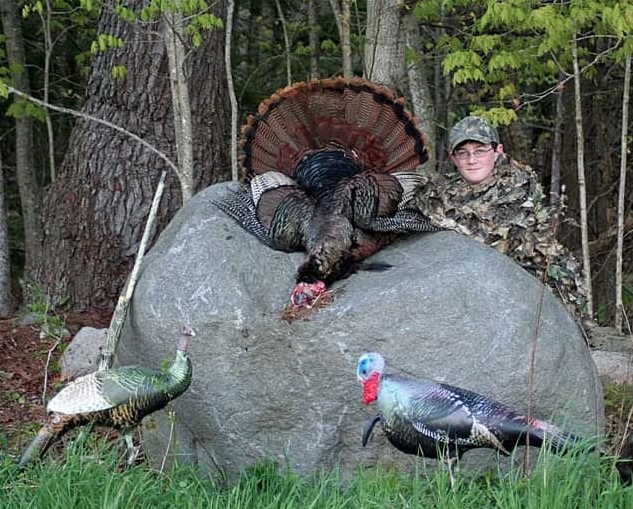 Dave Hentosh became his mentor and I remember receiving a picture several months later of Austin with his first turkey and Dave with a huge smile on his face. I couldn’t keep the tears from flowing. This combination of youth and warriors brought Medicine Lodge, KS to mind where I met Dale Lonker and a great team of people. One church was involved the first year, and now several years later, there are seven. At that first event, everything looked normal. When the camp was over, I was asked to preach on Sunday. Everyone who attended the camp was there. After church, Andrea Fisher along with other ladies from the Bible study group approached me, and with tears of joy, told me their husbands were normally so busy working that they didn’t attend church. With the men being involved with Kicking Bear, this was the first time all the families were together in church! 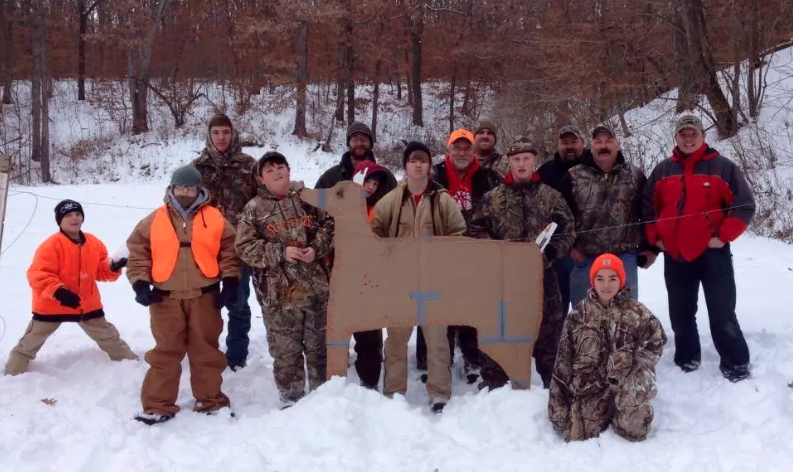 Soon after, Tom Lee organized Men’s Bible study groups, and together with Patriots of Praise, the veteran turkey hunts became a yearly tradition. We are so blessed to put on Kicking Bear camps because of the military God has given us and the freedom we have to share His Word. A story comes to mind of Colonel Mark Greenwood. You see, Mark was deployed to Afghanistan, and his son Jack was old enough to hunt. 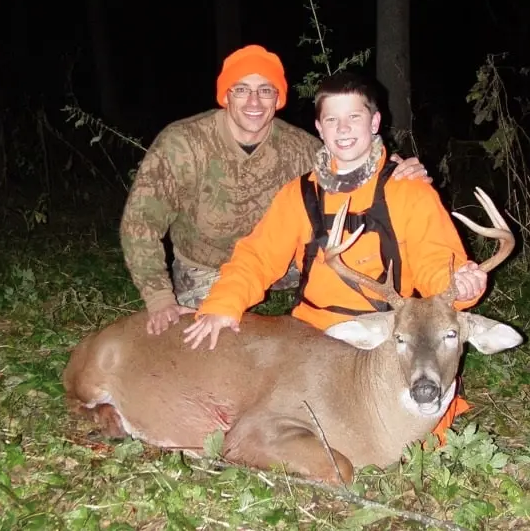 We got Jack involved with the KB Wisconsin Youth Deer Hunt. His mentor was J.P. Penzkover. I had never heard such an incredible story of laughter and fun! They told a hilarious story about the big buck coming in and how they tried to get an opportunity for the shot. Jack harvested that deer, a magnificent buck. Six months later, Jack’s Dad made it home safely. At the Kicking Bear banquet, Mark asked if he could say a few words. He shared what it was like to be so far from home and not knowing whether he would return, but while deployed, he had received a picture of J.P. and Jack with the deer (pictured below). Mark shared how it uplifted him, knowing that Jack was involved with Godly men who cared about him. As I listened to Mark’s words, they touched my heart and they still heavily impact me today. The most amazing thing to witness at the camps is the same thing that happened at the West Salem, WI camp. 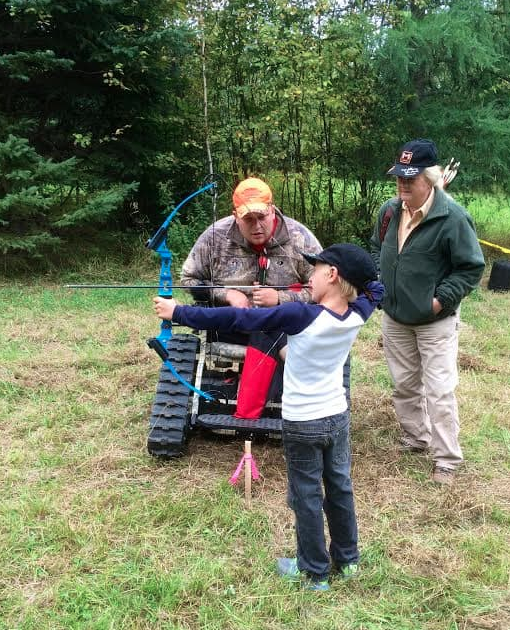 We come to these kids’ level with all the fun games, along with archery shooting, tomahawk throwing, tug-of-war, a giant slip & slide, and a marshmallow fight. As the sun was setting, a giant bonfire was lit, and the ashes drifted up to the sky. Then the fireworks were set off and were so close above our heads it seemed you could almost touch them. Later that evening, in front of the bonfire, the Gospel was shared, and the crowd listened so quietly that you could almost hear a pin drop. We said, “If anyone has made a decision for Christ, we have new Bibles for you.” A wave of people came up out of the crowd with their hands outstretched, and we couldn’t get the Bibles into their hands quickly enough. More and more hands kept reaching. 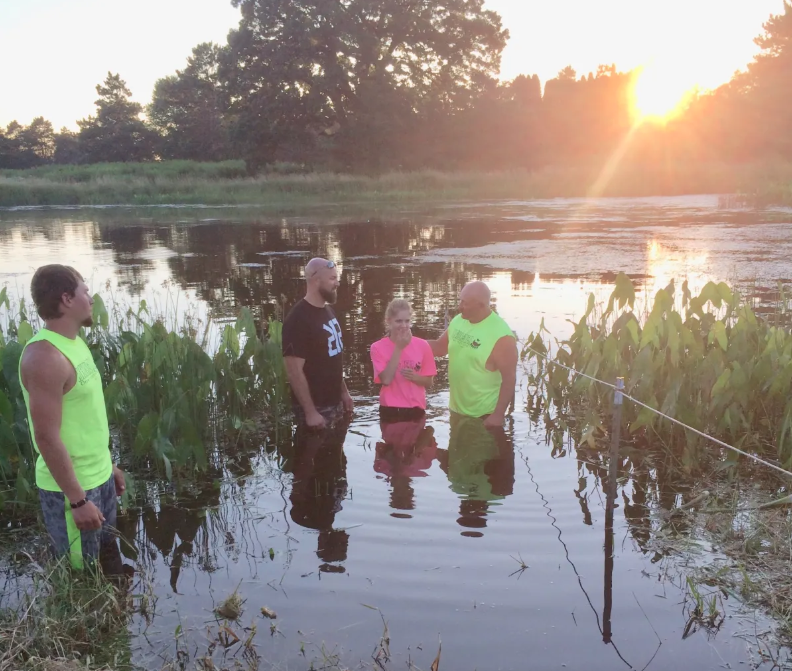 The next day when all the activities were finished, the youth and adult baptisms took place (below), and the emotion was overwhelming. Kicking Bear is now going into its 20th year. Just like the camp in Rockwood, TN, there are several new camps starting up next year in different areas of the nation that only God knows the heights to which He will take them. As we reflect on everything that has happened over the last 19 years, it is humanly impossible to do what has been done without God.